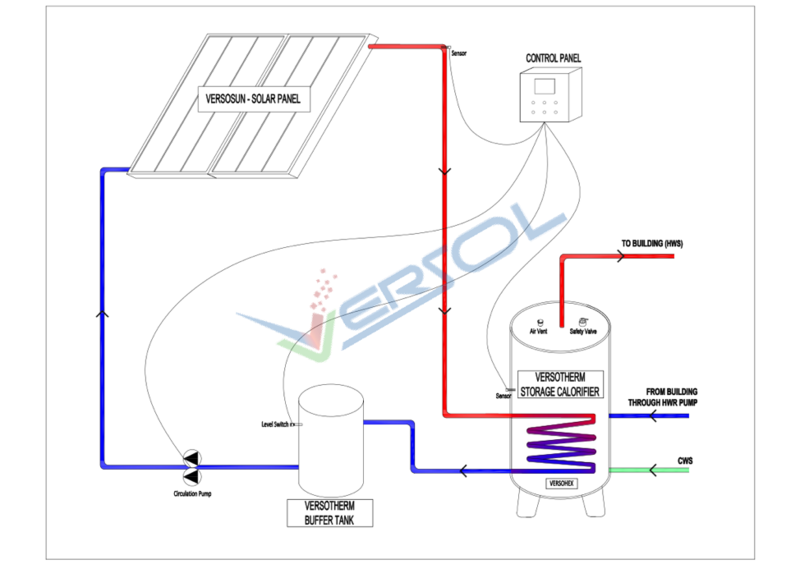 Thermosiphon system requires neither pump nor controller, it’s a passive hot water system and thus role as a less complex-ready to install system with very low maintenance and longer life. System is available up to range of 300 Litter capacity either with Solar flat plate collectors or Evacuated tube collectors as per customer requirements. Drain Back System is another type of indirect system that use pumps to circulate water through the collectors but the system is “open” type. The water in the collector loop drains into a reservoir tank when the pumps stop. This makes drain back systems a good choice in colder climates and also for installation where there is a risk of overheating. Drain back systems must be carefully design and installed to assure that the whole system is always completely drain down to the tank when there is no need for heating. VERSOTHERM Drain back tank collects all water in solar panels when the circulation pump is OFF or in other words when heating is not required. Circulation pumps works based on control system which has temperature sensors on both solar panel and Calorifier side. Circulation pumps are of Duty -Standby type. Water stored in Drain back tank is used for pre heating of water stored in Calorifiers. Calorifier water circulates through the internal heat exchanger in Drain back tank, this flow is facilitated by a dedicated set of circulation pumps. This pre heating helps to use a great amount of heat that normally get wasted in drain back tank, thus increases efficiency of system. Drain back systems have many advantages compared to other types of SHW systems. Hot Water loop is not pressurized. Less stress is placed on solder joints, threaded fittings, and gaskets. If a break occurs in the Hot Water loop plumbing, it will leak more slowly than if it was pressurized. No motorized valves to fail, and the system does not rely on electricity to maintain freeze protection. If the power goes out, the pump shuts off and the Hot Water drains from the collectors back into the reservoir. In Split System Solar, the Panel is placed on the roof and the actual water tank can be placed anywhere inside or outside the building. These systems are slightly more complicated and require a number of components such as Circulation pumps, Pre cool tank Expansion vessel, Emergency cooler Control valves, controllers etc. Our systems come complete with electronic controller, electrical backup and circulation pump. The Circulation pumps circulate heat-transfer fluid such as anti-freeze liquid, through collector or bank of collectors and then through the heat exchangers which are inbuilt or external to the storage tank. 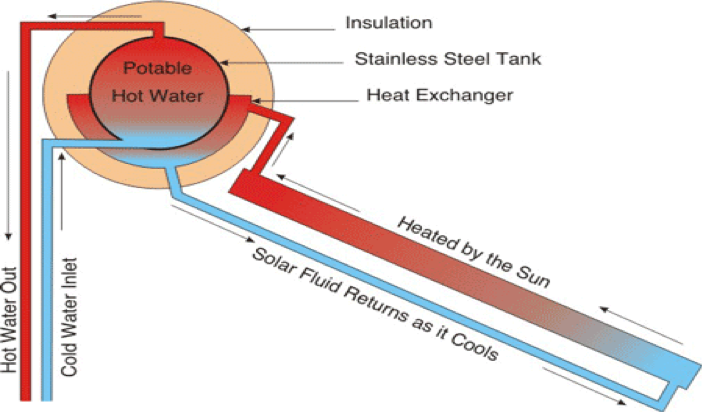 Heat exchangers transfer the heat from the fluid to the potable water stored in the tanks. 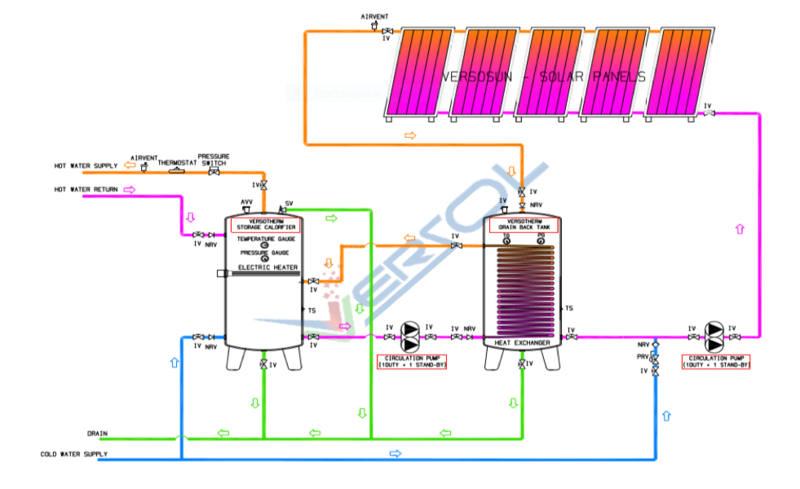 Some indirect systems have overheated protection, which protects the collector and the glycol fluid from becoming super-heated when the load is low and the intensity of incoming solar radiation is high. Emergency cooler can be the part of system for overheated protection. As the system is having pressurized loops, System is equipped with expansion vessels and pre-cool tanks. Expansion vessel help to suppress the extra pressure developed in the system caused of thermal expansion of working fluid. Pressure temperature safety valves also provided in the loop, to keep pressure and temperature within the range. 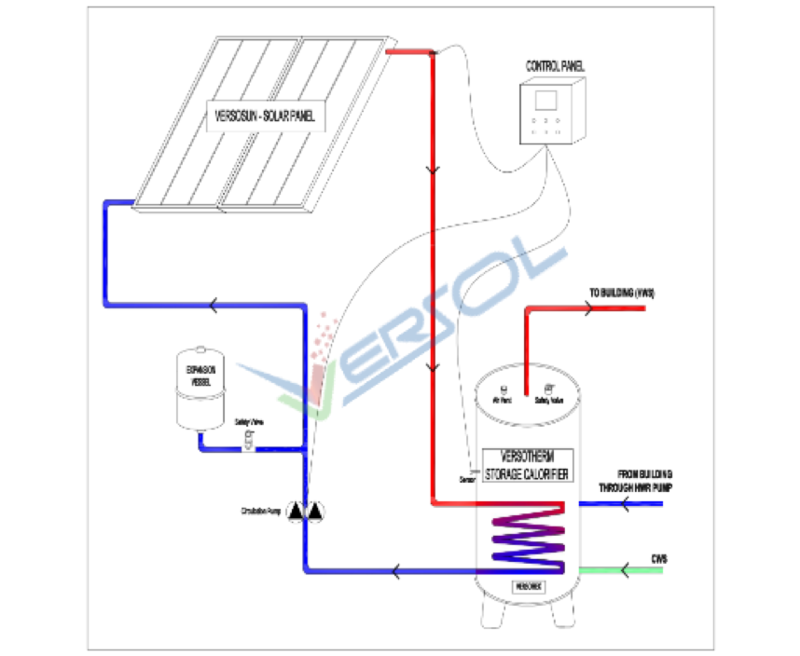 For High ranges of Hot Water Applications Split forced circulation system is considered. Split system performs primary heating source in many Hot Water applications.